We hire the best people available. Our people are and will continue to be the reason for our success. Offering an array of services. Making safety our top priority. We operate in accordance with government, industry, and internal safety policies. 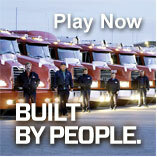 Paul's Hauling Ltd. is one of the leading providers of bulk transport service in Western Canada. The company was established in 1957 by Paul Albrechtsen in Winnipeg, and now has offices and terminals in a number of locations in Canada.